Sophisticated 7” TFT display, fully electronic control, clear-cut design, variety of functions. 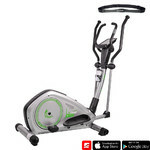 Suitable for home use, the Elliptical Trainer inSPORTline inCondi ET550i is an elegant, fully electronic machine with a sturdy structure. The inCondi ET550i features an easy-to-read, 7” TFT display with a computer which offers as many as 21 preset programs (divided based on resistance), user programs, an HRC program (heart rate-based exercise) and a WATT program. A manual program is a must. The computer is easy to use and intuitive and the data are displayed in a large font. 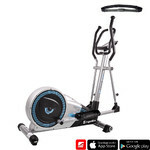 Since this trainer also features an USB output, you can plug in your USB flash drive and listen to your favorite music in MP3 format through the built-in speakers. The tablet/phone/magazine holder and two trays on the display console allow for a comfortable workout. Moreover, there is also the Pause function which allows you to stop the exercise and then start where you left off. 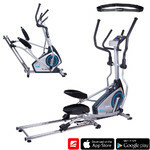 Elliptical Trainer inSPORTline inCondi ET550i can be synchronized with FitShow application which makes exercising more fun. 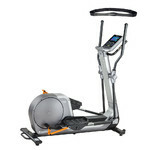 The Elliptical Trainer inSPORTline inCondi ET550i features a sturdy frame with a 120kg weight limit, which, together with the adjustable stride length (42 – 50cm), 18cm pedal spacing and ergonomic shape allows for a comfortable and effective workout. Both heart rate monitors and control panel (resistance, start/stop) are built into the handles. You may also appreciate the transportation wheels and uneven floor adjustment system. 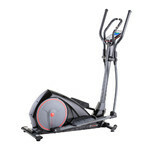 The large, anti-slip pedals provide safety during the workout. 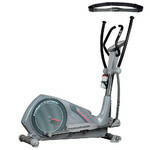 All of the above makes the Elliptical Trainer inSPORTline inCondi ET550i perfect for home gyms. Special programs "racing mode" and "virtual scenery"
Extended warranty applies to this product.